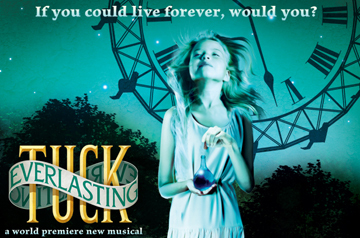 Broadway In Boston Hosts Sneak Peek Of New Musical, "Tuck Everlasting"
Boston was once a prominent "try-out town," meaning that plays and musicals came here prior to their Broadway engagements for, well, a try-out. Shows were re-written and polished, songs were cut, other songs were added, cast changes occurred and the barometer of the Boston audience guided creators in pulling the show towards perfection on its way to New York. "My Fair Lady," "Porgy & Bess," "Camelot," "Company," "Oklahoma," "Woman of the Year," "A Little Night Music," "Follies," "La Cage aux Follies" and others all made a stop in Boston for a bit of sprucing up. In turn, Boston audiences were able to brag that they saw all the great shows before they hit the Great White Way AND that they had a hand in determining their future. The dirty little secret was that audiences occasionally got to see the dregs as well -- perfectly awful productions, providing additional bragging rights for the limited few who got to see the train wrecks on stage (. . . think Quentin Tarantino in "Wait Until Dark"). With changes in the way Broadway shows are created these days, it's a rare occasion when a new show comes to Boston prior to Broadway. Which is why Broadway in Boston hosted a bit of a preview party recently for a new musical called "Tuck Everlasting," set to have its try-out here at The Colonial Theatre this summer from July 28 - August 18. Based on the highly regarded novel of the same time by Providence resident Natalie Babbitt, the story offers the question: If you could live forever, would you? Set in a small New England town, the story tells of a young girl dreaming of adventure who stumbles upon a family with a fabulous secret. Their chance encounter sends them all on a journey that tests everything they believe about love, life, and what it means to feel truly alive. Following a brief wine and cheese reception in the lobby, guests entered the Colonial to be welcomed by Broadway In Boston President Rich Jaffe, who in turn introduced Joyce Kulhawik to host the proceedings. Gathered on stage were composer Chris Miller, lyricist Nathan Tysen, Tony Award nominee Claudia Shear, who's written the book, and set designer Walt Spangler. Rounding out the group was Ms. Babbitt. In a casual Q&A conversation with Joyce, each shared their thoughts and hopes for the show. Respected director and choreographer Casey Nicholaw (who's in London at the moment preparing for the West End production of "Book of Mormon") appeared via video on a huge screen above the stage. As Walt Spangler spoke about his creative process, audiences got to see a video montage peek at miniature models of the set -- a coup for attendees as Mr. Spangler pointed the images will not be seen by audiences anywhere else. Ever. As an added treat, three of the show's cast members emerged from the wings to sing a trio of songs from the show. Starring as Winnie will be Sadie Sink (currently appearing in the acclaimed revival of "Annie" on Broadway), who sang "Tuck's" title song. She was then joined by Tony Award nominee Carolee Carmello, a veteran of a dozen Broadway shows including "City of Angels," "1776," "Mamma Mia!," "Sister Act," "The Addams Family," and the recent "Scandalous." Ms. Carmello sang what is projected to be one of the big ballads of the show, "My Most Beautiful Day." Finally, Andrew Keenen-Bolger, who's currently dazzling audiences in Disney's "Newsies" on Broadway, came on stage to join Sink in the duet, "At The Top Of The World." When the show plays here this summer, the cast will be completed by Fred Applegate, Mary Louise Burke, David Garrison, Michael Park, Michael Wartella and Valerie Wright -- Broadway pros all around. This will be the first pre-Broadway engagement for a show in Boston since 2004. So mark your calendars.